In recent years, understanding electrochemical process such as electrodeposition (also known as electroplating) has become evident in various technologies and sciences including microelectronics, nanobiosystems, solar energy conversion, chemistry, among others, due to its wide range of applications [1,2]. Electrodeposition is a conventional process that utilizes electrical current through a solution called electrolyte to modify surface properties, either chemical or physical to make the material suitable in certain applications. Based on the principle of electrolysis, it is a process that applies direct electrical current into an electrolyte solution to reduce the cations of a desired material and deposit particles onto the conductive substrate surface of the material .This technique is commonly done to enhance electrical conductivity, improve corrosion resistance and heat tolerance, and to make products more aesthetically appealing. A good deposition mainly depends on the substrate surface morphology .Thus, a technique that can measure this characteristic and monitor electrodeposition process in nanoscale is greatly needed. There are several methods that were employed for this surface characterization. Examples include scanning electron microscopy (SEM) and scanning tunneling microscopy (STM). These techniques allow measurement of structures on the nanoscale, however, some of them are ex situ, some typically requires high vacuum, and others are not applicable in monitoring continually changing process because of its time consuming image acquisition [2,5].To overcome these shortcomings, Electrochemistry combined with Atomic Force Microscopy (commonly known as EC-AFM) was introduced. This technique allows users to perform in situ imaging and visualization of changes in surface morphology of sample being studied under certain electrochemical environment in nanoscale . In this study, the deposition and dissolution of copper particles into the gold surface was successfully demonstrated. The morphological changes of the copper particles was clearly observed in situ using Park NX10 AFM and a current-voltage (CV) curve was simultaneously acquired using the potentiostat during the experiment. A liquid probehand shielded with glass was used instead of conventional probehand to allow measurement in liquid. A NANOSENSORS PointProbe® Plus-Contact (PPP-CONTSCPt) cantilever (nominal spring constant k = 0.2 N/m and resonant frequency f = 25 kHz) coated with platinum and mounted on Teflon chip carrier was used in the experiment. Platinum coated cantilever was selected to maintain beam intensity when the tip is immersed in the solution. Moreover, the tip was mounted on Teflon chip carrier to protect the EC Cell from other unwanted electric signals that could affect the conditions of the electrolyte solution. A small EC Cell manufactured by Park Systems was used in the experiment. The cell is made of polychlorotrifluoroethylene (PCTFE) to ensure chemical stability. A sample is mounted with a top cover and sealed with a thin silicon O-ring to securely prevent leaking on the backside of the sample. The working electrode (WE) that was used is gold (Au) in the 111 orientation evaporated on a mica surface while reference electrode (RE) and counter electrode (CE) are silver chloride (AgCl) and platinum-iradium (Pt-Ir). The 3 electrodes were connected on a Solartron Modulab XM potentiostat. The aqueous solution contained 0.1mM CuSO4 in 50ml of 0.01 mM H2SO4. Sulfuric acid was added in the solution to stabilized and prevent copper to precipitate. The deposition and dissolution of the copper particles in gold thin films with 111 orientation was monitored using a Park NX10 system. A reference image of the gold surface was acquired in ambient air and in liquid condition without introducing chemical reaction to serve as a point of comparison of the sample surface before and after the experiment. The images was acquired using non-contact mode, to get high quality image. After obtaining the reference image in-liquid, the 3 electrode was connected into the potentiostat. The CE and RE were bent before immersing in the liquid solution to make a good contact and prevent saturation of the signal. AgCl electrode was utilized as RE since a chloride solution was not used. Furthermore, Pt-Ir electrode was selected as CE since this material is chemically stable, hence it will not contaminate the solution. In EC-AFM, the WE is the sample surface where the electrodeposition process takes place, the CE is where the electric current is expected to flow. EC cell is like an electronic circuit and the main function of CE is to close the current loop in the circuit, the RE is used as a fixed reference point and serves as a feedback to maintain a stable voltage in the solution. An electric field is supplied in the working electrode to transmit electrons to the ions in the solution so that oxidation or reduction will take place. The type of chemical reaction depends on the amount of voltage supplied (either positive or negative voltage) in the EC cell. In this study, a cyclic voltammetry was applied in the EC cell to know the oxidation and reduction peaks of the solution. After determining the threshold voltage where the oxidation and reduction occurs, linear sweep voltammetry was applied to deposit and dissolve copper particles on the gold surface. Two scans were performed with -0.2 V to -0.4 V to cover the entire surface of the gold with copper particles. On the other hand 4 scans were performed with -0.2 V to 0 V to completely dissolve the copper in the solution. Figure 2. Cyclic voltammograms. The negative peaks demonstrate the reduction reaction state where copper is deposited in the sample. While the positive peaks demonstrate the oxidation reaction state where copper is dissolved in the sample. Figure 2 shows the CV curve obtained during cyclic voltammetry. 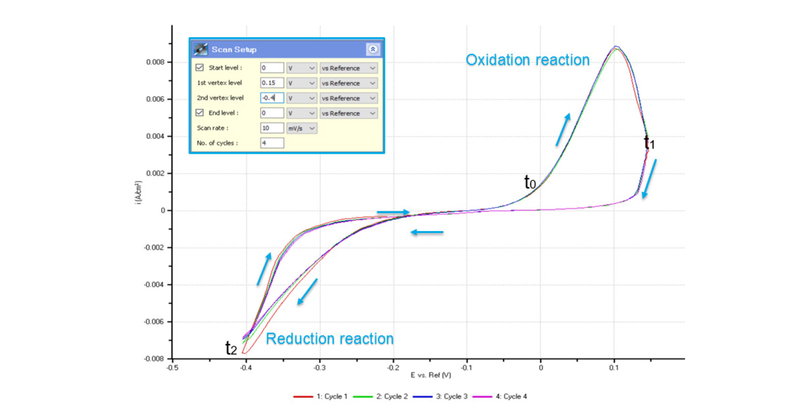 4 complete cycles of oxidation and reduction process (redox process) was selected in obtaining the curve. The result implies that these processes are reversible depending on the amount of potential applied on the solution. The deposition of copper begins when -0.2 V was applied on the cell and the highest reduction state takes place when -0.4 V was applied. The result can be interpreted that more negative potentials applied on the cell will increase the magnitude of the copper deposited in gold surface. On the other hand, the dissolution of copper begins when the voltage is 0V and the highest oxidation state takes place in application of 0.1 V. The magnitude of the copper dissolved in the gold surface will increase as more positive potentials applied on the cell. The CV curve also shows that in -0.1 V, the solution is in neutral state wherein no chemical reaction takes place. Figure 3 – (a) AFM image acquired in air, (b) AFM image acquired in liquid. 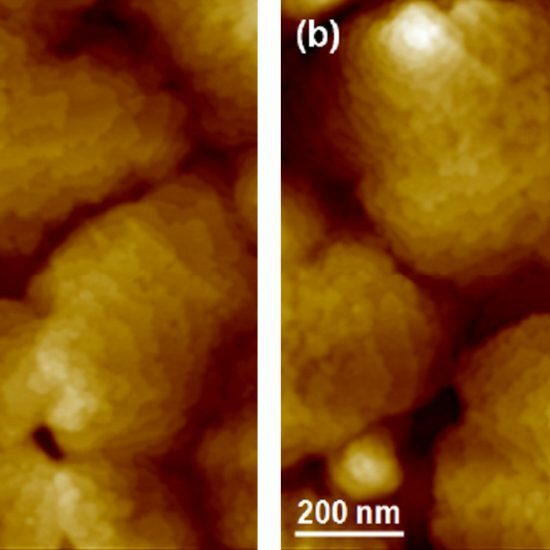 Figure 3 (a) and (b) revealed that the 5um by 5um scanned region in ambient air and 1um by 1um scanned region in liquid condition of gold surface is made of individual grains which are believed to be crystalized. The high quality images show that no foreign particles are present on the surface prior introducing electrochemical reaction in the solution. The redox process was confirmed using AFM and voltages were applied using linear sweep voltammetry. Figure 4(b) and 4(d) shows the CV curves acquired by applying voltages from -0.2V to -0.4V. The current density decreases as more negative voltages were applied. This phenomenon demonstrates that reduction reaction is occurring. Figure 4(a) and 4(c) confirms this process wherein the images clearly show that copper particles were successfully deposited on the gold surface. Copper particles were quantified using XEI software developed by Park Systems which marked each detected particles with different colors and numbers. The detection method used in XEI is Upper Threshold Grain Detection. In this method a threshold value is set and particles whose heights are smaller than the threshold value are not detected. Figure 4 – (a) and (c) AFM images acquired on 1st and 2nd deposition test, (b) and (d) CV curves acquired using linear sweep voltammetry with voltages from -0.2V to -0.4V on 1st and 2nd deposition test. In this experiment 5.5 nm was used as a threshold value to quantify the copper particles. Since the gold surface is composed of individual grains with various heights, most of the copper particles deposited on lower surface with height value smaller than the threshold value were not detected. Figure 4a shows the image acquired during the first deposition test. The number of particles detected on this test was approximately 7 with mean area value of 2 nm. In addition, there are particles deposited on lower regions with smaller height value that were not detected by XEI. Furthermore, 199 particles were detected on the 2nd test with mean area value of 36 nm as shown in Figure 4b. The data shows that the number of particles deposited on the 2nd test is 28 times more than the number on the 1st test with larger area which covered almost the entire region of gold surface. 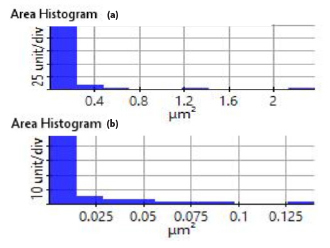 Figure 5 – Histogram plots of particles area distribution on 1st (left) and 2nd (right) deposition test. The CV curves acquired by applying reverse voltage from -0.2 V to 0 V during dissolution process show that current density increases as more positive voltages were applied. This phenomenon demonstrates that oxidation reaction is occurring. The AFM images acquired in this process confirm that such phenomenon happened since the number of copper particles deposited on the gold surface decreases when dissolution tests were performed. Figure 6 (a) shows the image acquired in the 1st dissolution test. The number of particles detected on this test was 180 with a mean area value of 37 nm2. The number of particles detected on this test was slightly fewer with a smaller mean area value compared to particles detected on the 2nd deposition test. Almost similar results were observed in 2nd dissolution test wherein the number of particles detected was 181 but with a smaller mean area value of 24 nm2. On the other hand, the results on the 3rd dissolution test are far from the first two test. The detected number of particles was only 19 with a mean area value of 7 nm2. Lastly, the 4th and final dissolution test shows that almost the remaining copper particles on the gold surfaceincluding those deposited on the lower region were completely dissolved on the solution. 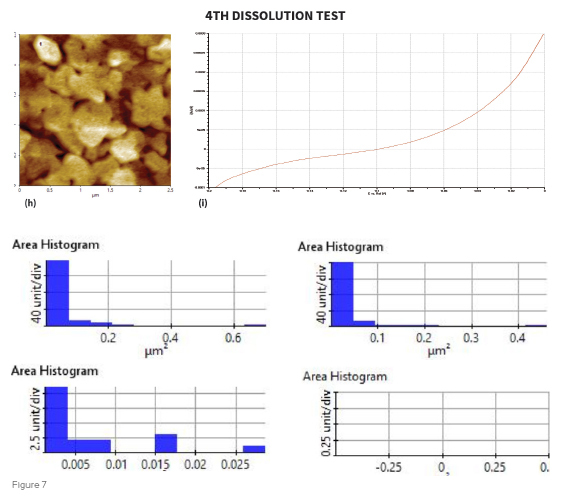 Figure 6 – (a), (c), (f), and (h) AFM images acquired on 1st to 4th dissolution test, (b), (d), (g) and (i) CV curves acquired using linear sweep voltammetry with voltages from -0.2 V to 0 V on 1st to 4th dissolution test. Figure 7. Histogram plots of particles area distribution on 1st (upper-left), 2nd (upper-right), 3rd (bottom left), and 4th (bottom-right) dissolution test. 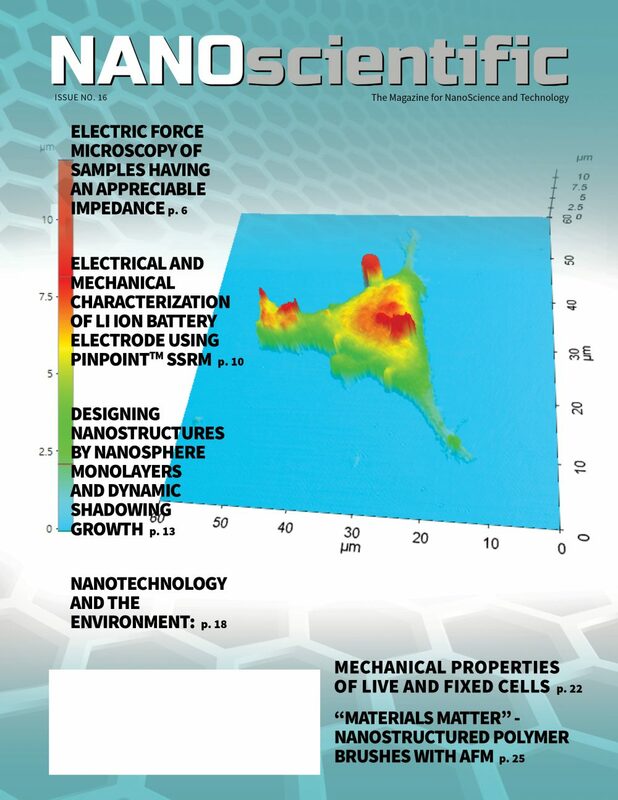 Here we demonstrate the use of electrochemical atomic force microscopy in situ monitoring of morphological changes of samples that are undergoing electrochemical process. The deposition and dissolution of the copper particles on the gold surface were successfully performed by applying the suitable voltages suggested by the CV curve acquired during cyclic voltammetry. 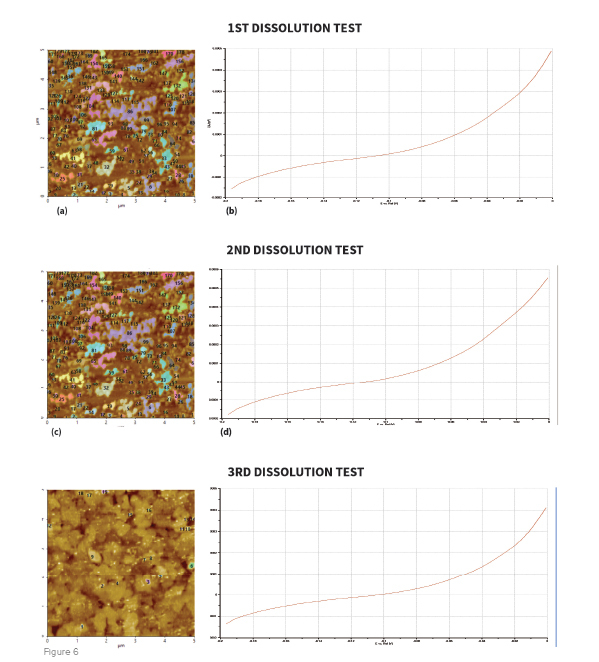 The data on the deposition process demonstrate that the magnitude of copper deposited on the surface increases tremendously on the 2nd deposition test. On the other hand, the dissolution data shows that greatest number of copper nanoparticles was dissolved on the 3rd dissolution test. 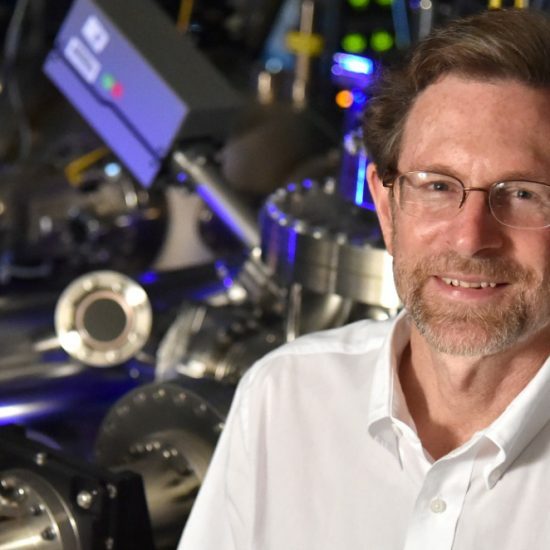 Overall, the technique described in this study will successfully provide researchers nanoscale information that is significant in monitoring an electrochemical process. 5. Smith T., et al. Electrochemical SPM Fundamentals and Applications. 6. Reggente M., et al. 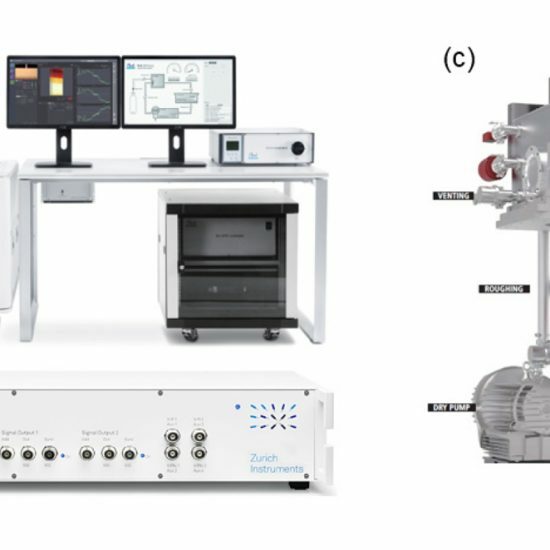 Electrochemical atomic force microscopy: In situ monitoring of electrochemical processes.